The women and girls who access this stage are those individuals who consciously request help and protection to escape their abusive situation of human trafficking and sexual exploitation. It initiates a thorough process of personal and emotional development. It aims to establish a model for the acquisition of basic skills and habits, which from the very moment of involvement helps them to adapt to the situation they need to confront. The framework of coexistence and support for the women is implemented in the flat with the help of a multidisciplinary team along with the support provided by the work of the mediators. It also guarantees adequate protection and housing conditions which contribute to the victims’ recovery and to the restitution of their fundamental rights. In addition, they are informed of the possibilities around them so they can make decisions regarding whether or not to cooperate with the police investigation and in the judicial process and if they choose to return to their home country or to reside in Spain, during the Period of Re-establishment and Reflection in which they are allowed by Law. Whatever the decision might be, they are helped and accompanied in all of the necessary administrative processes and procedures, as well as in their physical and psychological recovery; offering them an education and labour insertion programme as an alternative to the exploitative situation they have suffered. When the victim is a minor, special protection mechanisms are put in place. Over the last few years, APRAMP has detected an increase in the number of minors in situations of trafficking and sexual exploitation. 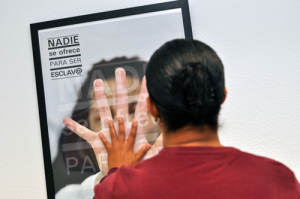 The majority being between the ages of 15 and 18, of Romanian, Nigerian, Chinese and Paraguayan nationality, children of trafficking victims, and adults who began to be exploited as minors. The special methodology of the Rescue Unit team provides Detection and Identification; permitting that every year more minors are identified, thanks to the development of the specific indicators by the team. When APRAMP’s teams identify a minor, they inform the Police so they can intervene, and therefore, activating the mechanism of protection for minors. However, until now no specific resources existed for minor victims of trafficking. Centres for minors do not have the necessary training or protection for these types of victims.